The planet Venus is seen crossing the sun in June 2004 as photographed through a telescope at Planetarium Urania in Hove, Belgium. 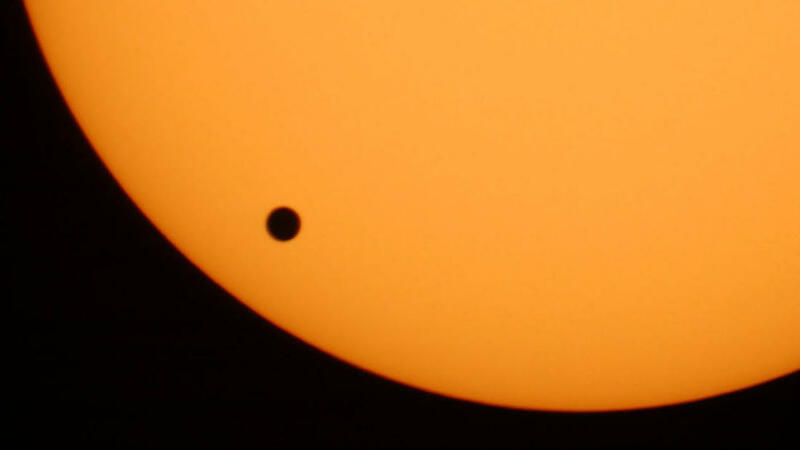 The earliest known observation of such a transit was in 1639 by English astronomer Jeremiah Horrocks. This map provided by NASA shows the visibility for Tuesday's transit of Venus. Click here for information on the best viewing times for your location. Without an accurate distance between the sun and Earth — known as the Astronomical Unit — astronomers couldn't deduce the exact size of the solar system and had no way of knowing for sure how far away the stars were. The Astronomical Unit has been "fundamental to figuring out the distances of everything in astronomy," says Michael Strauss, a professor of astrophysics at Princeton University. Enter Edmond Halley of comet fame. In 1716, he alerted the scientific community to be ready for the 1761 and 1769 transits of Venus. He noted that if Venus was observed from multiple spots as it crossed the disc of the sun, you could use something called the parallax method and some trigonometry to get the much sought sun-Earth distance. Although Halley, who died in 1742, was long gone by the transits of the 1760s, his historical timing was nonetheless impeccable. "This was the Age of Discovery, and people were finally able to start mounting big expeditions around the world for all kinds of reasons," Strauss says. So how did the parallax method work? "You observe the moment at which Venus touches the disc of the sun, what's called first contact," Strauss says. "What you're measuring is when Venus, the sun and the observer all appear to be in a straight line." From different locations on Earth, that lining up occurs at slightly different times. It takes about seven hours for the total transit, so the difference between observations might be as much as a few minutes — easily measured by clocks of the day. "You want to know exactly how long it takes, because that duration gives you a [base]line and that line you can then fit onto the sun," says Owen Gingerich, a professor emeritus of astronomy and the history of science at Harvard University. The line forms the base of a triangle, and triangles make good yardsticks, says Gingerich, who spoke to NPR from California, where he is preparing to observe today's transit. By knowing the exact distance between the two earthbound observers and comparing the differences in their observations, you can draw a pair of triangles that will give the distance from the Earth to Venus. Thanks to the work of mathematician Johannes Kepler, 18th century astronomers already knew Venus' orbit is about 70 percent that of Earth's. So if you know the distance between the Earth and Venus, you can easily figure out the value for the Astronomical Unit. But it wasn't that simple. Because of something called the "black drop effect" having to do with density differences in the sun's outer layers, the observations were a little skewed. That threw the post-1769 figure for the Astronomical Unit off by a few percent from the correct answer. Still not bad, actually. 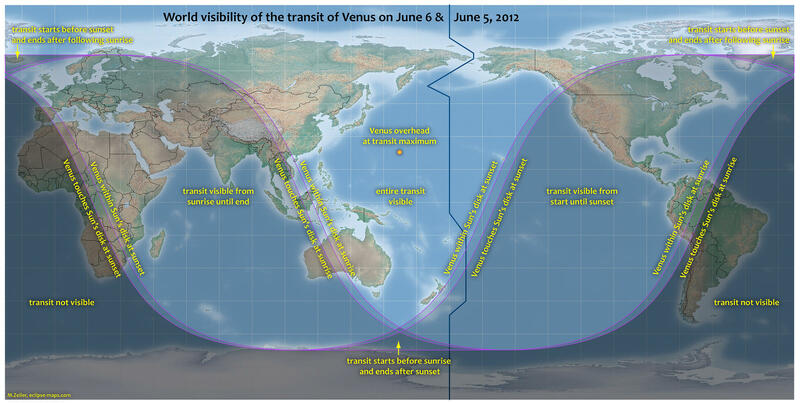 And how did the transit of Venus give us the distances to the stars? The parallax method turns out to be good for figuring out how far they are, too. But since the stars are so much more distant than Venus, a much longer baseline was needed. Instead of two different geographic locations, the observations needed to be made during two different points in Earth's orbit, say one in June and another in December. Knowing the length of the Astronomical Unit (and therefore the size of the Earth's orbit) allowed scientists to know just how long the base of that massive triangle would be.